This story originally appeared in the September/October issue of BIKE. 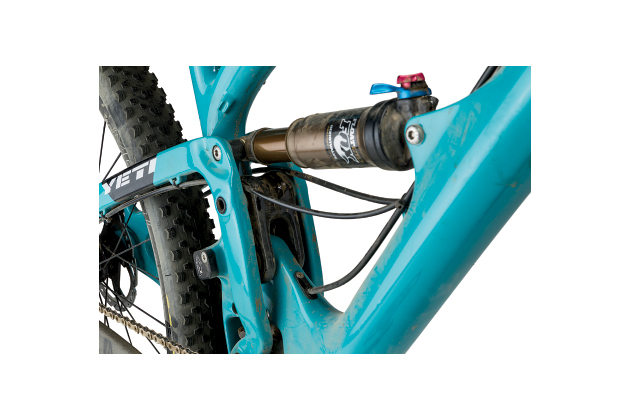 IT'S BEEN ONLY A TAD MORE THAN THREE YEARS SINCE YETI introduced its 'Switch Technology' suspension platform on its 'SB' (Super Bike) line of full-suspension rigs, drawing accolades from longtime Yeti lovers while also converting new members to the tribe. We at Bike were early advocates of the company's flagship Switch Technology bike–the 6-inch-travel, 26-inch-wheeled SB-66–and we reveled in the countless hours of trail time spent aboard that capable all-rounder. 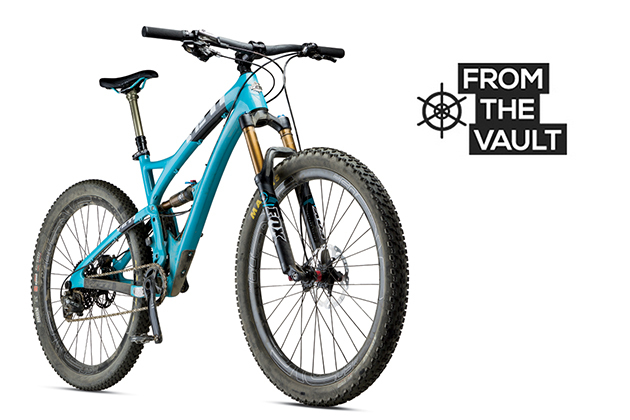 And when Yeti rolled out its 29-inch-wheeled version of that bike, the SB-95, we scrambled to get our hands on one and immediately began comparing and contrasting how it performed vis-à-vis its 26-inch sibling. Most of us were sold on the versatile suspension design, and one of us even bought a carbon SB-66 as his personal bike. So when we were told last year that Yeti would soon be unveiling yet another new suspension platform–to be named 'Switch Infinity'–we were both shocked and intrigued. Given the overwhelming success of the SB-66 and SB-95, why had the company gone back to the proverbial drawing board? Why were they trying to fix something that, in our estimation, was not broken? The grim reality in this cutthroat industry of proprietary parts and design patents is that bike manufacturers–particularly the smaller ones–must constantly be thinking years in advance, and it turns out that Yeti's top engineers had been working closely with Fox Racing Shox on this radical new platform for almost three years. When we got our first look at the patented new 'translating pivot' a few months ago at Yeti's headquarters in Golden, Colorado, it was clear that they had designed something unique. 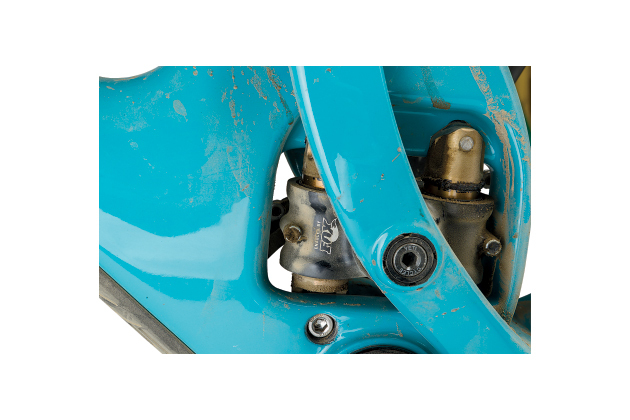 This translating main pivot–affectionately nicknamed 'The Hooha'–moves upward at the beginning of its travel, creating a rearward wheel path with distinct anti-squat characteristics. Out on the trail, this could immediately be felt while climbing, particularly through steep, chunky sections of momentum-sapping singletrack. During my first rides on the SB5c, I intentionally sought out some of the steepest, rockiest, most thankless climbs I know to see how it would pedal, and I was absolutely blown away. Regardless of whether I had the Fox Float CTD rear shock in 'Climb,' 'Trail' or 'Descend' mode, the pedaling was precise, and the rear wheel hugged the ground like a mother re-united with a lost child. Through the burliest stretches, I left the shock wide open in 'Descend' mode and was rewarded with the satisfaction of cleaning frustrating patches of loose rock that often force me to walk. Over time, I found that the bike actually climbed better in 'Descend' and 'Trail' mode, so I decided to leave the shock open all the time. Of course this setting was perfect for charging downhill, so I took the SB5c down some of the most vertical, rutted-out trails in Laguna Beach, California, to see how it would fare. On demanding descents that I normally reserve for bikes with 6 inches or more of travel, I was continually amazed. Despite only sporting 5 inches of travel and a 67-degree head angle, the SB5c handled like a beefier all-mountain bike, fairly purring through consecutive small bumps and square-edged hits while also soaking up sizeable drops without sacrificing much speed. In this respect, I noticed a palpable improvement over the SB66's performance, which in my experience has tended to favor small bumps over back-to-back drops. With each descent, I began to look forward to a 6-inch-travel version of this bike, which Yeti will inevitably produce. And the sooner, the better. The SB5c will initially only be available as a complete bike with one parts kit, featuring a SRAM XO1 11-speed drivetrain, Shimano XT brakes and DT Swiss 350 wheels for $6,600. The addition of a Thomson Elite dropper post will add another $350 at retail, and upgrading to Enve M60 wheels will bring the price up to $9,000. Yeti plans to eventually offer a frame-and-shock-only option. AT FIRST GLANCE, THE NEW YETI SB5C IS LIKE NO OTHER BIKE I've ever seen. The new 'Switch Infinity' suspension system is unique, and a radical departure from the original 'Switch Technology' found on the most recent generation of 'SB' designs. Was this new link just another way to achieve that same ride quality of the previous system, or would the 'Switch Infinity' link provide a ride quality that was just as unique as it looked? The first thing I noticed about the SB5c was the outstanding pedaling efficiency of the rear end. The Switch Infinity system does have some anti-squat characteristics to the way that it pedals, but surprisingly that wasn't the defining feature that made it feel so great. It was the pedaling performance through the rough, chunky, momentum-killing sections of trail. 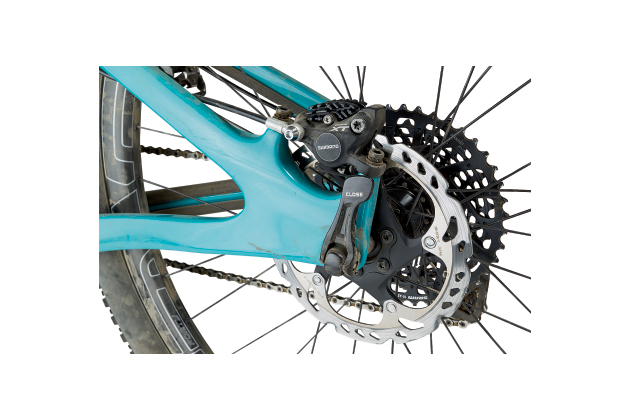 The Switch Infinity link is able to work almost independent of the rear shock, so even with the Fox Float CTD firmed up in 'Trail' or 'Climb' mode the link would still provide the necessary movement for the rear wheel to get up over and through those rough sections of trail without sacrificing any efficiency. It gives the bike a unique plush yet firm feel that really grabs your attention and makes you want to charge up everything in your path. The same attributes that the Switch Infinity link displays on the way up are also present on the way back down, and it's glorious. It made the rear suspension feel much more capable than its 5 inches of travel. It almost had a bottomless feel through big, square-edged impacts; a feeling that you don't expect from your standard trail bike. It never felt like the rear end would have the tendency to get hung up on anything–it just kept me moving forward and looking for speed. No matter where the shock seemed to be in the rear travel, the Switch Infinity link was always ready to give just a bit extra to get me through unscathed. On my first ride aboard the SB5c, I quickly found myself ditching the planned route and redirecting toward all my favorite steep technical trails that I usually reserve for bigger-travel bikes: steep, loose, lay-off-the-brakes and grit-your-teeth types of trails. The SB5c didn't skip a beat. Anything I could throw at it was handled brilliantly. And for all that descending prowess, it only took a few quick pedal strokes back uphill to remember how great it climbed. It's very much a split personality. Over the time I was able to ride our test bike, the Switch Infinity link showed no worrisome hints of any potential issues. It performed flawlessly. I would, however, be curious to see how a hard season of abuse and neglect would affect it. With a top-quality build kit and a suspension package that inspires confidence both up and down, it's tough to argue that Yeti doesn't have something special on its hands with the new SB5c. Our original intent was to launch this Switch Infinity technology several years down the road, but after testing the design for nearly three years, we saw it was a marked improvement and decided to release it now. As for the question of whether it's durable, hell yeah. The system was developed in conjunction with Fox Racing Shox, so the parts are bombproof. The seals are from the off-road division and the bearings are from current Fox forks. Also, the parts went through the Fox testing protocol, including a dirt-slurry immersion that lasted over a million cycles. Still not enough? We will warranty the part for two years.